“It’s not hard to work out. Make the system about helping people get work instead of about punishing people.” – Susan, unemployed worker, Melbourne, VIC. July 2018. The purpose of this report is to critically examine the current mainstream employment services system, jobactive, and assess the experience of unemployed workers with the system against its stated objectives and promised services. 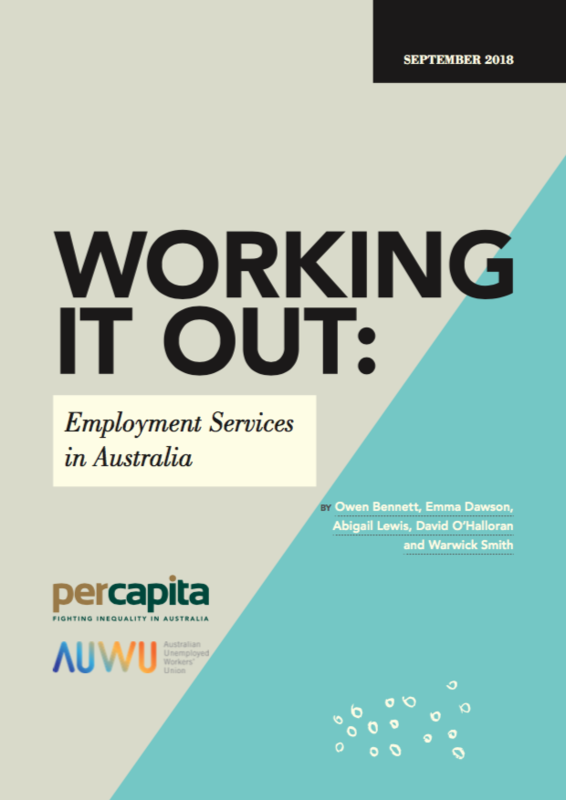 A key aim of the research is to bring the voices of unemployed workers in Australia into the public conversation about employment services and about unemployment more broadly. The report is published at a time when the Department of Jobs and Small Business is undertaking a review of the Future of Employment Services, under the guidance of an expert advisory panel chaired by Sandra McPhee AM, and during an Inquiry into “the appropriateness and effectiveness of the objectives, design, implementation and evaluation of jobactive” by the Senate Education and Employment References Committee. As 2018 marks two decades since Australia introduced the world’s first fully privatised employment services system, such reviews are particularly appropriate, and it is hoped that the findings of this report will inform the considerations of policy makers in their assessment of the operation of the system. to a million unemployed workers that year were penalised when they had done nothing wrong. At considerable cost and with such broad powers, it is important to evaluate the effectiveness of Australia’s employment services. Therefore, this report sets out to answer some critical questions. Does jobactive meet its stated goal? Does it provide its promised services? How does its ‘mutual obligation’ system affect unemployed workers? To inform our assessment, we engaged directly with those who know employment services best: the people who receive them. We held a series of focus groups and consultations with unemployed workers across the country to understand what life is like for people engaging with employment services. Seven of these participants also shared their stories and experiences of being unemployed and engaging with employment services in the form of personal essays, which we have included throughout this report. “It’s not that I don’t understand the question but it’s just that I think it’s impossible to think of a positive outlook for this system. What I need from them is when I am in not a good place, they should be there to support me – if I am in a good place, I can job search myself, but you go in and they just want to send you to jobs that you are not ready for. It would be not having to fight for every single little thing. It would be actual genuine support in looking for a job. I avoid going there because I get so anxious beforehand, knowing that I have to kind of corner them into doing something for me. You have to brace yourself because you will be made to feel that being unemployed is your fault.” – Suzie, unemployed worker, Perth, WA. July 2018. This quote, from one of the attendees of our Perth focus group, summarises the findings of our research. The unemployed workers we interviewed say that the current employment services system is not offering genuine employment services to them and that it imposes requirements on them that do not improve their employment prospects but are linked to fees and ‘outcome payments’ for their jobactive provider. Few unemployed workers that we spoke to find attendance at employment agencies to be helpful in their search for lasting employment. On the contrary, most report their attendance at job agencies is a cost and a barrier to their search for work. These focus groups brought the voices of unemployed people into our research, which investigates the history of employment services in Australia and the assumptions about the sources of unemployment and the reasons unemployed workers face challenges in finding work that underpin our current employment services system. Employment services were first conceived in an era when Australia consistently averaged a two percent unemployment rate and were therefore premised on the assumption that there were enough jobs for all who wanted to work. The abandonment of a full employment policy in the mid 1970s changed this context. The ratio of ‘job seeker’ to job vacancy has since increased to the point where there are now eight job seekers for every available job, but employment services have not responded accordingly. The assumption remains that unemployed people could work if they wanted to. The result is arguably a system that penalises unemployed workers for not being in jobs that don’t exist. “They’re a compliance agency for Centrelink, not an employment service.” – Paul, unemployed worker, Sydney, NSW. July 2018. Given these fundamental problems, merely adjusting the current system of contracting and resource allocation will not adequately address the concerns demonstrated by our research. Some serious analysis and a reimagining of the core purpose and operation of jobactive is warranted. Our research has informed several recommendations for improving the employment services system.